Why we love it: The Los Angeles-based designer offers up a jaw-dropping exploration of form and material in this coffee table. The oil-rubbed finish highlights the gorgeous grain of the wood and gives the piece a warm hue. Why we love it: There’s nothing quite like this vintage design, which features a complex mix of materials. From the rattan and bamboo base to the removable tiled tray, vintage never felt so new. Why we love them: Sleek legs beautifully balance a slab of cut wood in this rustic design. The organic shape is an eye-catching addition to both modern and traditional décor schemes. Why we love it: Curated by Harvey’s on Beverly, this boomerang-shaped coffee table is by mid-century modern designer John Keal. The bleached mahogany legs contrast against the warm wood veneer. Why we love it: Hand-carved from solid wood, this antique has cracks in the patina, giving it one-of-a-kind appeal. Though it is a bench, the piece is low enough to work as a coffee table. 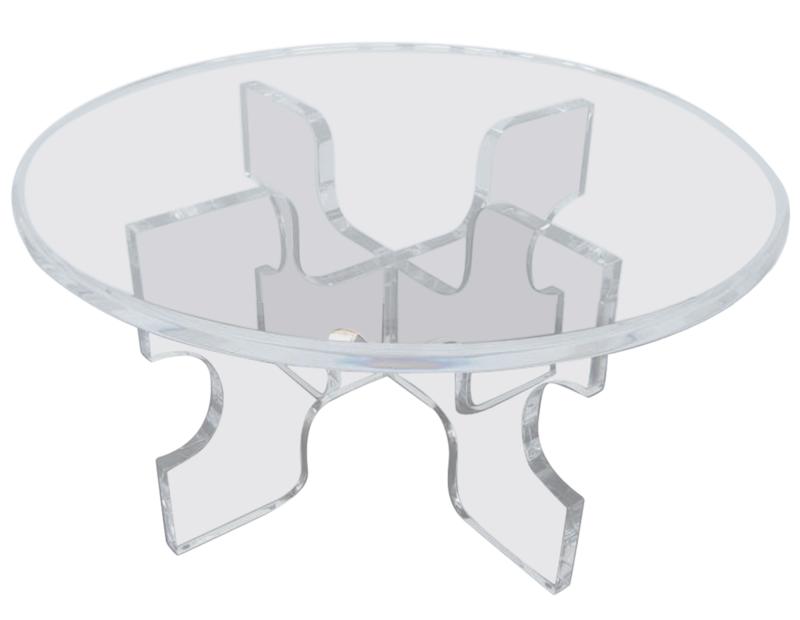 Why we love it: Clear Lucite shifts the focus to the sculptural form of this table. Its round shape makes it a natural choice for pairing with L-shaped sectionals or as the center point for four accent chairs. Shop more coffee tables on Viyet!